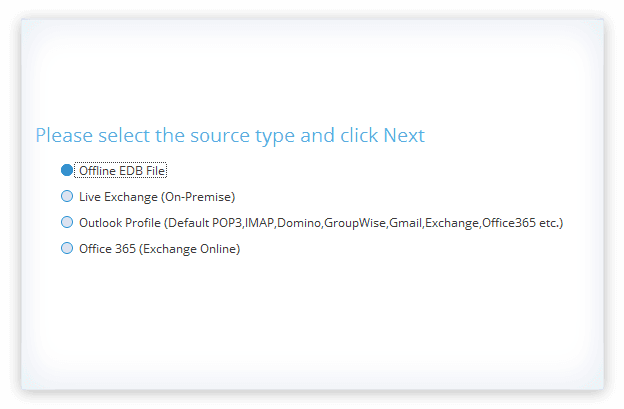 Convert corrupt EDB files to PST, Live Exchange Server and Office 365. * Download trial version and Save 25 items per folder free. I have tested the SAVE it to PST option & it works like a charm, This EDB to PST Converter can also be used in the environment where you take backup of exchange server using Snapshot technology & then you can use snapshot restore /extract the PST from EDB to restore the particular mailbox. Read more..
We came in to an issue with accessing existing emails on a local Exchange (Exchange 2007) during a somewhat rushed migration to Office 365. We’re happy to say that the recovery using Kernel for EDB to PST went as we had hoped. We got the mailboxes required and had them converted in to a usable format in a reasonable timeframe. When the corruption occurred, we did not even have a fairly recent backup of the database. It was a 550 Gb database, and we used SSD disk to store the corrupted .EDB file on. Using Kernel for EDB to PST converter, we managed to retrieve the missing emails lost during the window of the last successful backup and the corruption. You will find recovering the corrupt EDB file quite easy with EDB to PST converter tool as it can fight any possible error or corruption. Apart from primary mailboxes you can also recover archive mailboxes and public folders. First, it scans the EDB files, recovers the data, and displays it in a neat tree structure format. With EDB to PST Converter, you can back up your mailboxes and Public folders to PST files. Select the on-premises Exchange (live Exchange Server) as source and export the mailboxes and public folder data to PST files. You can also create backup of individual items to formats like MSG, EML, RTF, and HTML. You will never find any hardship while converting a large-sized EDB file to a PST file. As the tool saves each mailbox to a separate PST file, the recovered data will be safe and secure. And if you have very large mailboxes in the EDB file, you can choose to save them in multiple PST files utilizing the PST split option of the tool. Thus, the tool helps you manage large EDB files as well as large mailboxes. To find any specific item, you can use the Search facility of the tool which allows you to find an item based on different criteria and properties of an email in EDB. You can find an email based on subject, message body, From, To, Cc, and Bcc. Another criterion are Mail properties (category, message class, importance, read status, message size), date, and attachment (attachment name, type, body, and size). Kernel for EDB to PST Converter has been designed with such a flexible and user-friendly interface that the software takes only a few steps to recover the Exchange EDB data and export it to PST file. No log files are required in order to recover Exchange mailboxes. Various recovery methods like copy-&-paste, drag-&-drop, and export to PST make the conversion the easiest part of the whole process. Apart from saving the mailboxes from offline and dismounted EDB files to PST, you can export mailboxes from EDB to Live Exchange, Office 365, and hosted Exchange accounts. You can migrate data from Exchange Server to Exchange Server, Office 365 to Office 365, Exchange to Office 365 and vice versa. 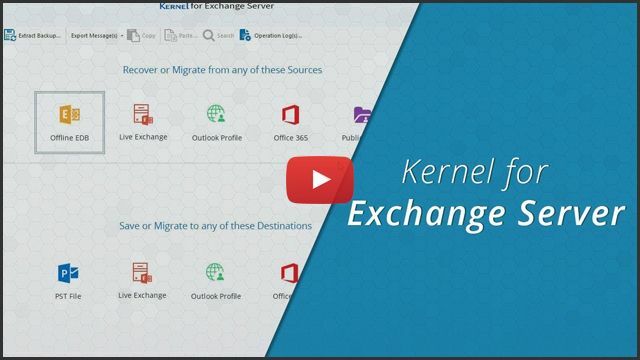 The Kernel Exchange Suite is a complete package for every Exchange recovery and migration needs. If you have backups for Exchange data, and wants to recover from it, then EDB to PST converter tool has a special feature to extract Exchange data from backup files. You can easily extract EDB files from backups made by NT Backup, Symantec, VERITAS, etc. It supports each version of Exchange & Outlook and you can recover any EDB (Priv1.edb) or STM (Priv1.stm) file with the same efficiency and effectiveness. How to convert EDB to PST using Kernel EDB to PST Converter? Launch the tool and select offline EDB as the source type. Select the EDB file that you want to convert. 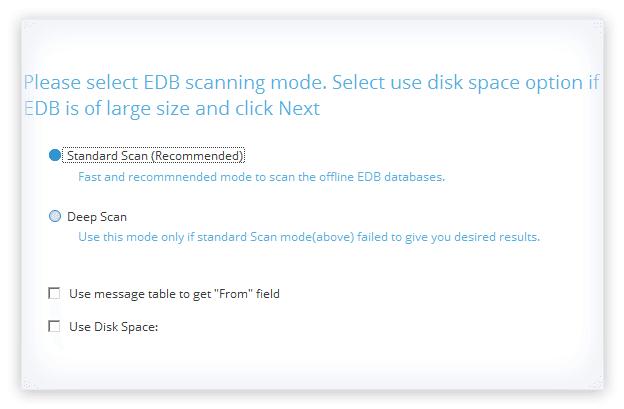 Select the specific scanning mode to scan the EDB file. Once the EDB file is added to the tool, right-click the root directory and select Export Mailboxes to PST. Now, choose whether you want to create a new PST file or convert the data to an existing PST file. 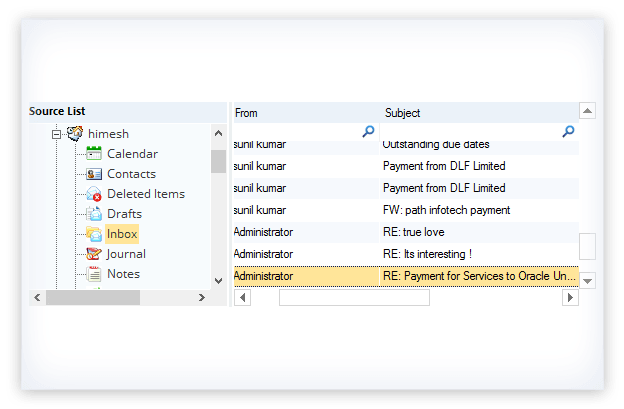 Select the specific filters if any, and then click OK.
Are deleted mailboxes recoverable from my EDB with your software? Yes, they are recoverable. 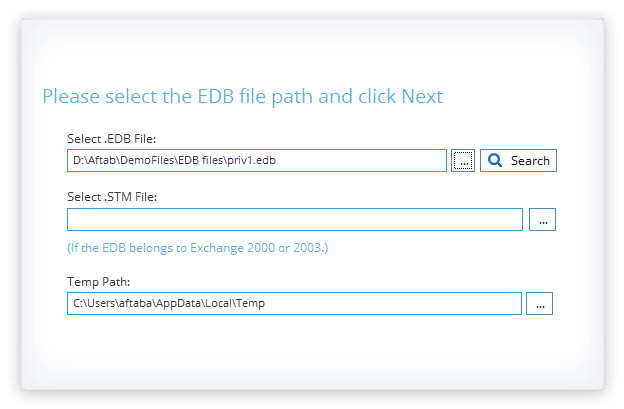 Run the Kernel for EDB to PST tool and select your EDB database. It will scan the EDB file and show you all mailboxes along with deleted ones. Please note that deleted mailboxes are recoverable only if you have dismounted the EDB file before expiry of the retention period. Otherwise they are not recoverable. Here is an easy way to save your emails free of cost. You do not need to pay anything. Launch the Kernel for EDB to PST Converter. Now select scanning mode, click Next and Finish. Select the mailbox and click “ Search “ option from tool bar or from the right-click menu. There are lots of filters available in the software, you can search any specific email by applying the required criteria. Here you can input various properties of your emails like Message Subject, Message Body, From, To, Cc, & Bcc (in From/To fields, input the name of the Sender/Receiver and search it). I have lost my archive mailboxes from Exchange Server; can this tool recover the mailboxes from the EDB file? When any mailbox is deleted from Exchange server, they are still present in the EDB files (till the retention period is over). Kernel EDB to PST converter can easily recover every deleted mailbox from the EDB files. I have lost the Log file of my exchange database. Does this tool need the log file to recover mailbox items? Our tool does not require log file to recover items. Its robust algorithm enables it to recover items from EDB file only. Can I make a backup of my Live Exchange Mailbox to PST file? Where can I select the Live Mailboxes in your software? Here you can select Multiple Mailboxes (with admin user ) or Single mailbox. Here you can select Multiple Mailboxes (with Global admin user) or Single mailbox. Put Exchange IP address or Exchange Name; then add user name (admin user for multiple mailboxes/public folder & specific user id for single/archive mailbox) Put Office 365 mailbox id (Global admin user for multiple mailboxes/public folder & specific user id for archive/ single mailbox). Your mailbox(es) will be connected to Source. 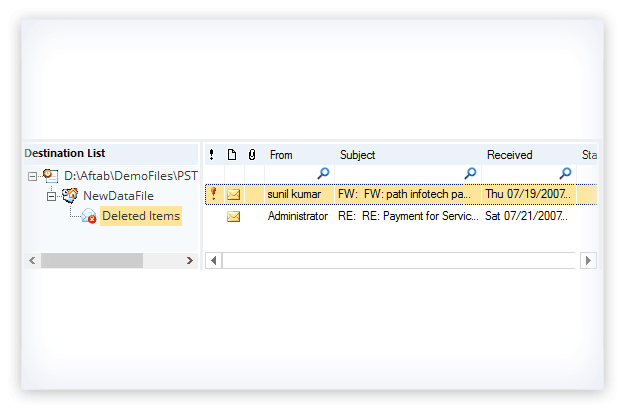 Now Select the Mailbox and select Export to PST files. Please contact support@nucleustechnologies.com in case you will need any help. Thanks. I was searching for EDB to PST Converter software. I found many tools. I have chosen yours over all others. Can I test it before purchasing? You are most welcome. We do have free trial version available. If you are looking to save only specific emails, then it is totally free of cost. With this free version you can open working EDB as well as corrupted ( orphaned ) EDB files. You can connect to Live Exchange, Office 365 and Hosted mailboxes. The free version allows you save 25 items from each folder of every mailbox. The free version helps you to search for items. You can save the searched items also. How long should I wait before getting the full version activation details? I have urgent need for mailbox recovery. Can I Import Exchange 2010 to PST? Yes. You can recover mailboxes from Exchange 2010 EDB database and save each or selected mailboxes as separate PST files. Exchange 2010 public folders databases are also supported for public folder recovery. Is this tool free to use? It is available as free version, however, with the trial version, you can save up to 25 items per folder only. You’ll have to purchase the licensed version of this tool for full benefits. Kernel for EDB to PST migrated the restore items to live exchange server the client was very much satisfied as the tool helped to migrate Exchange Server 2010 mailboxes to Exchange Server 2013.